Internet or call-in polls don't always accurately reflect the views of everyone, because only a subset of "everyone" participates. Each day, Pittsburgh all-news radio station KQV asks a question. 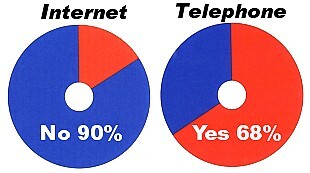 People can vote either on the Internet or by telephone. The right-leaning Pittsburgh Tribune-Review publishes the same question but gives only the phone numbers, not the Web address. Almost every day, the Internet voters are strongly liberal and the telephone voters are strongly conservative. I know I musn't worry, Harry. Still I wish you'd hurry, Harry. When sung, premium rhymes with see me um. Who would have thought? My car has several square feet of unused space on its rear bumper. Sometimes I think I ought to use that space for this message. It's not as though I would be claiming to be a police officer or anything. 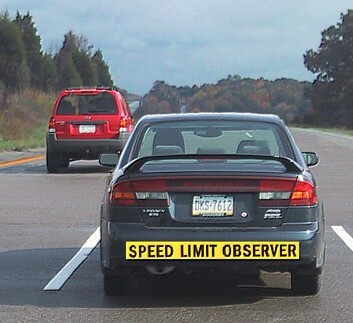 I would merely be identifying myself as someone who observes the speed limit! 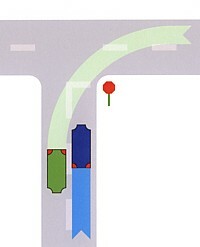 Perhaps that would slow down the other drivers briefly, before they ignore the law as usual and go flying past me. ME. The newspapers say that because of all the rain this year, the farmers in Plant City are worried about their strawberries. They soak up too much water and explode. MIKE KOBIK. Isn't there something about that in the National Anthem? ME. "Berries bursting in air . . . ."
MIKE. "Strawberry light . . . ."
STAN SOBOLAK. You guys are sick. By the way, were you wondering how I took that picture above of my car observing the speed limit? It's a composite. I took the photos in 2001 and 2005. The scenery is in Kentucky, my car and the SUV are in a Pennsylvania parking lot, and the bumper sticker is in my imagination. The average driver has apparently gotten too lazy to turn the steering wheel more than 60 degrees. Or maybe he's gotten too busy, since he's steering with one hand while yakking on his cell phone. 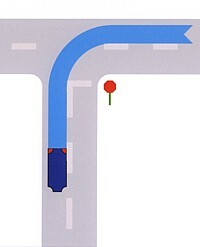 As I in my blue car approached an intersection tonight  fortunately, I hadn't yet reached the stop sign  a green car made one of these left turns in front of me. My driver's education teacher in high school, Dudley Wills, said that we should stay on our own side of the road and make our turns square. And, by gum, I do! GEORGE (spirit of a dead Indian). What do you mean by pray? DHARMA. I don't know. Talk to the universe, or God  or the Great Spirit, whatever it is? GEORGE. Huh. So you're having a conversation with the Great Spirit, the maker of all things? GEORGE. And you're doing the talking? I check TV Guide weekly, listing TV shows I want to record for later viewing (because I'll be watching something else or away from home). I use this list to program my DVD recorder and VCRs for the week. I'll be away for two evenings during the week beginning December 26, 2005. But my list for the week is completely blank  for the first time in about 15 years. That's okay; I already have a big backlog of tapes. But still, what does it say about the state of television? Or possibly the state of my tastes? Why was it funny that we never saw these sitcom characters' faces? Or that these characters were never cast at all? Why does he need to be live in Douglas County? And less repetitive intros, please! Long ago I got in the habit of touching all my pockets when I stand up, to make sure that nothing's missing. I do this anytime I leave my house, get out of the car, leave my seat in a restaurant, and the like. If this quick inventory comes up empty somewhere, a mental alarm goes off, and I remember that I left my wallet on the table. Football teams can have season records of 14-2, but baseball teams don't go 141-21. One reason is that the baseball season is ten times longer, so there's more time for what mathematicians call "regression to the mean." Hot streaks and cold streaks will eventually cancel each other out. But I've always suspected that chance plays a bigger role in the outcome of baseball games. Because of bad hops, close calls by the umpires, and that sort of thing, even a poor team will get lucky four times out of ten. Compared to my start as an electronic graphics operator in 1982, I don't have to work as hard. At games where statistics can be downloaded from a database, I no longer have to type them. Also, I now have two co-workers: the operator of a second "Fox Box" machine, and a coordinator who confers with the producer. And I'm now earning twice as much! However, now I have to know how to get my software to work properly, through file copying and computer troubleshooting and other cybertechnical stuff. And the dollar is only worth half what it was in 1982.